AIMIM candidate Akhtarul Iman: If Yadavs and Paswans can have their own parties, why can't Muslims? Why has the Grand Alliance sent Lalu, not Nitish to counter AIMIM? Among the six seats the AIMIM is contesting in Bihar, it's strongest bet is said to be Kochadaman. It is here that the party has fielded its strongest candidate, former MLA and state president Akhtarul Iman. And it is here that the AIMIM supremo Asaduddin Owaisi seems to be working the hardest. In fact, even Owaisi's brother Akbaruddin Owaisi addressed his first rally in Bihar in Kochadaman on 4 October. He was subsequently booked for allegedly making an inflammatory speech. A predominantly rural constituency, Kochadaman is unlike the two seats the AIMIM won in Maharashtra last year - Byculla and Ahmednagar East. And it is an entirely different world from Owaisi's pocket borough of Hyderabad. Kochadaman has, in many ways, become a test case for the success of Owaisi's national expansion plans. The AIMIM is fortunate to have a strong candidate in Akhtarul Iman, who represented Kochadaman from 2005 to 2014. He had to resign the seat after he quit the RJD to join the JD(U) just before the Lok Sabha election. The JD(U) gave him a ticket to contest that election from Kishanganj, but midway into the battle, Iman voluntarily withdrew in favour of the Congress candidate Maulana Asrarul Haque. "It was matter of principle. I did not want to help the BJP by splitting secular votes. I withdrew for the sake of secularism," Iman says. Haque won with a margin of nearly 2 lakh votes, the largest for a Congress candidate in North India after Sonia Gandhi in Rae Bareli. This was partly due to Iman's sacrifice. The sacrifice seems to have gone in Iman's favour as many voters feel he should be rewarded for it. "It is not easy to give up something like a Lok Sabha ticket. The Grand Alliance should have acknowledged what Akhtarul Iman did," says Mohammad Israr Alam, a farmer from Kochadaman. Having withdrawn from the contest without consulting the JD(U) leadership, Iman's stay in the party became untenable, but he didn't leave. It was only in August this year that he joined the AIMIM. By then, the JD(U), RJD and Congress were in the process of coming together. "They did what Akhtarul Iman sahab had done a year ago - co-operate for the sake of secularism. The JD(U) leadership was angry with him when he withdrew in favour of Asrarul Haque, and now they have joined hands with the Congress," says Ahtesham, who is part of Iman's campaign team. Iman is now being projected as Bihar's Owaisi. Even at his rallies, party workers hail Owaisi as "Sher-e-Hindustan" and Iman as "Sher-e-Bihar". 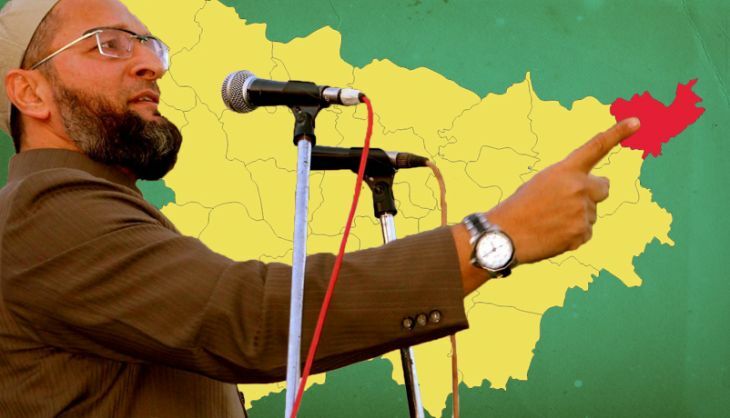 "He will be the sole voice taking on the other 242 in the Bihar Assembly just as Owaisi stands in front of 542 others in the Lok Sabha," says Tariq, an AIMIM supporter. Having been in the RJD for many years and briefly with the JD(U), Iman now feels that Muslims need to have their own party. "If Yadavs and Paswans can have their own parties, why can't we? Whenever these parties are in power, the representation of their caste brethren in government jobs increases manifold. But we are 17% of the population, we can't even get 5% of the chaprasi jobs," he explains. If Iman wins, his success could be used by the AIMIM to woo Muslim MLAs in other parts of the country. Last year, Shoaib Iqbal, the then JD(U) MLA in Delhi, is said to have been in negotiations with the AIMIM. He eventually joined the Congress, but lost in the AAP wave. The Congress MLA from Bhopal North Arif Aqeel was also rumoured to have been in talks with the AIMIM. Kochadaman is unique also because it is one of the two seats where the BJP has fielded a Muslim candidate. However, Abdul Rehman, the party's nominee, is said to be relying largely on Hindu votes. Iman's direct competitor is the sitting JD(U) MLA Master Mujahid Alam. Alam won the seat in last year's bypoll, necessitated by Iman's resignation. The Grand Alliance realises that if the AIMIM opens its account in Bihar this election, it could pose a more serious threat to its Muslim support base in the years to come. They are, therefore, sparing no effort to keep the seat. RJD supremo Lalu Prasad held a rally in Kochadaman on 1 November, a day after Owaisi did. Even though Alam is a JD(U) candidate, it is Lalu and not Nitish who is supposedly taking up the challenge of countering the AIMIM. Apparently, the reason is that Owaisi has been fiercely attacking Nitish for his "silence" during the Gujarat riots and his alliance with the BJP. In contrast, he has nothing much to attack Lalu on. Also, Lalu, with his witticisms and oratorical flourishes, is able to counter the AIMIM's rhetoric more effectively than Nitish. Unlike Maharashtra and Uttar Pradesh, Bihar doesn't have a history of Muslim-based political parties. Muslim leaders, clerics and organisations have by and large tended to support the RJD, Congress, Ram Vilas Paswan's LJP and the JD(U). And unlike those two states, the Muslims' dissatisfaction with the secular parties is much lesser. AIMIM's victory in Kochadaman and, perhaps, one or two other seats where it is putting up a good fight, could open up a space for such parties. For Owaisi, winning at least one seat in Bihar would make him a serious player in north India, which is critical to his main mission - the 2017 UP election. He could also use it to make inroads into neighbouring West Bengal, which is right across the border from Kishanganj and goes to the polls next summer.